Gather, forage, pick, harvest, collect, reap, dig, scoop, fish, and hunt are methods animals, whether mammal, bird, reptile, or other non-plant being use to accumulate food. Watching animals acquire food can be great entertainment, a lesson in perseverance, and a joy to watch. Lake Clark National Park situated on the western shores of Cook Inlet, opposite the Alaskan Kenai Peninsula, is home to the Ursus arctos horribilis, more commonly known as the revered and feared grizzly or brown bear. 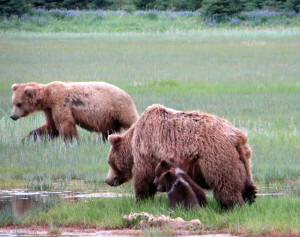 Alaska Homestead Lodge on the banks of Silver Salmon Creek at the base of the Aleutian Range offers half-day to multiple day tours to observe the daily bear cycles of eating, napping, and meandering in their habitat. The bears are not tame, but used to people observing them. Being immersed in their natural environment, I marveled at the dining diligence of these bears. We rode out to the coastal plain in 4-wheelers with a guide, bear spray, bug protection, and our cameras. As long as we were quiet and did not move quickly, we were safe to observe the animals, even as they moved amongst the vegetation towards and away from us while eating their sedge/grass meal. At one time, we were able to turn a full circle and view 11 different bears in seven different groupings: a mother and two new cubs, a mother with a 2-year old cub, two older siblings and four solitary males. A solo male sauntered past a mother and cubs, concerning us that a fight could happen. Our guide said that a male could kill a cub, if he saw a prospective female. But to mate, the female had to be cub-free. This Momma had two cubs and even though there was a runt in the litter, killing two cubs would be virtually impossible with an angry Momma, as she fiercely protects her cubs from human intrusion and other bears. There was a little grunting and some stern looks, but the solo male knew he was no match for this Momma. Tides on Cook Inlet are far-reaching extending out hundreds of yards providing significant feeding real estate. After completing the on-shore salad course, at low tides the bears amble out for a clam entree at ebb tide. 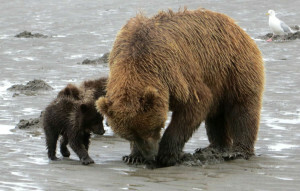 Cubs are taught by their Momma how to sniff out the clam’s home and then dig 12 to 18 inches into the sand to retrieve the delicacy. Our Momma bit into the shell and slurped the bivalve into her gullet. Leaving the shell and a pile of dirt behind, the bear trio scouted for the next clam victim, while any remnants were scooped up by waiting gulls. Once satiated with multiple clams, the bears found a place to snooze back in the grasslands until they are hungry again. At the North Carolina shore, I observed the daily bird feeding rhythms. With the heat of the noon-time sun, only the sun-worshipping humans were out. Birds were abundant during the lower tides at the start and the end of the day. 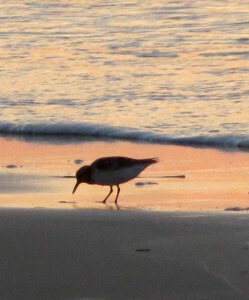 Sandpipers flitted around poking in the sand to retrieve edibles. Pelicans would soar just above the waves diving for a fish at an opportune moment and then swooping up to swallow their meal. Seagulls were always on the look-out for fallen prey. Humans are capable of finding food in the wild, too. We gather blueberries, forage for mushrooms, dig for clams, fish, or hunt. Many people no longer continue these past-times, as food is abundantly available at the local grocery store. Savoring a freshly picked huckleberry on a September afternoon in a high Alpine meadow is a joy beyond belief. Creating salsa from self-harvested tomatoes, onions, cilantro and jalapeno binds me more closely with my sustenance. Reconnecting with and gathering our food is a chance to taste unbridled delight. This entry was posted in Local Food by Kathryn Gardow. Bookmark the permalink.